Don Payne was the acclaimed screenwriter of "Thor," "Fantastic Four: Rise of the Silver Surfer," and "My Super Ex Girlfriend," among others, and an Emmy- and WGA-winning writer and producer of the "The Simpsons." He passed away from cancer March 26. When the news broke of Don's passing there was an outpouring of sadness on twitter and Facebook from those whose lives he touched, including myself. Don was genuinely kind, witty, and talented. We spoke a year or so ago and then a few months ago via email when he told me had cancer. I cried and prayed for his recovery. As several noted, those who knew him -- even briefly -- were extremely loyal to him. He inspired the best in everyone and touched many. We stayed in touch over the years, exchanging fun family holiday cards, and he always had a funny line or advice. He genuinely cared. It meant a lot to me that someone of his stature believed in me as a writer. I counted him as a friend. He had a hugely successful career but always took time. I first met Don when he was my teacher at UCLA in the masters program in screenwriting. Being accepted into Don's small, hands-on writing workshop (we had to pitch to get in) was the highlight of my time at UCLA. He was funny, regaled us with funny anecdotes about "The Simpsons" and inspired us all. He was respectful and supportive of us as writers. Even me, a pregnant woman (who was feeling the pregnant "mush brain" at the time) and who wanted to write sci-fi. UCLA honored him with a well- deserved Chair. 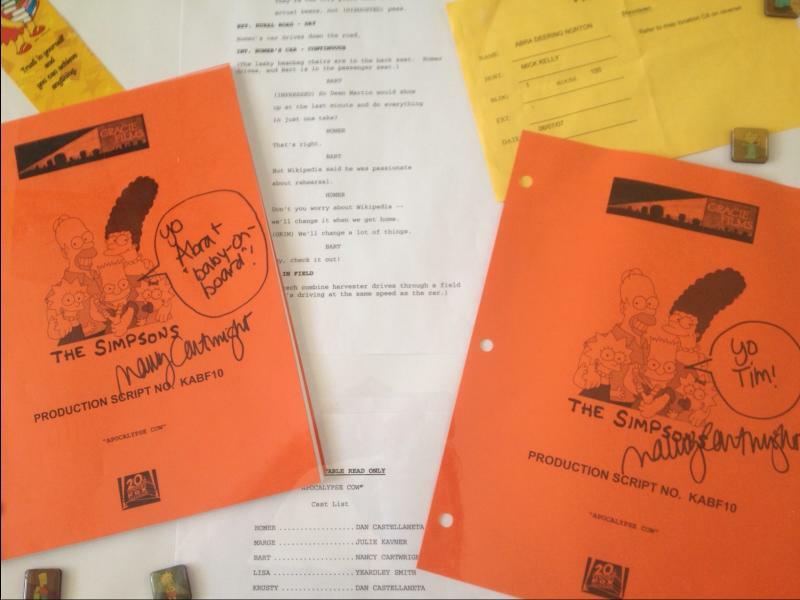 My husband, a classmate and me were fortunate enough to be invited by Don to "The Simpsons" table read at Fox. He gave us a personal tour of the iconic writers room, their magical board on the wall and what all their inside jokes meant. He took us to his bungalow office on the Fox Lot. We sat right behind Don and the entire cast – Matt Groening was there that day, Hank Azaria, Nancy Cartwright. I'm originally from the Midwest and naturally shy around celebs, but Don made sure we could talk to the cast. Nancy Cartwright came over and we chatted about my pregnancy. She signed my script, for the "Apocalypse Cow" episode, with a dedication to my not yet born daughter. I got tears in my eyes. The moment which defines to me who Don is was when he invited me to lunch at the Fox Commissary. It was the end of the semester at UCLA and it was time to get my final grade on my screenplay. Most professors invite you to their office or are late to meet with you – not Don. He reserved a table for us in the Executive Dining Room at Fox. When I sat down for lunch Don waived to an executive across the room. It was a big executive who was the president of some motion picture division. "She wanted to meet with me," he said, "but I told her no because I was meeting with you." I stared at him. I couldn't believe it. "Don," I said, "I'm nobody. I really think you should take that meeting." But he was very adamant and said, "Abra, that's not how I roll. I don't do that to people. My meeting with you is important." Don was amazing like this to everyone he came in contact with. A great person. A role model for me in this business. I was proud to know him and he was the closest thing to a mentor I'll ever have. When we last spoke, Don told me he was going to beat it. I believe Don did beat it. It didn't change who he was – a great, giving, kind and wonderfully talented human being who was loved by all. That's quite a legacy. Don believed in dreams. My deepest condolences to his family. I feel fortunate to have known him. He will be missed but he will be remembered.